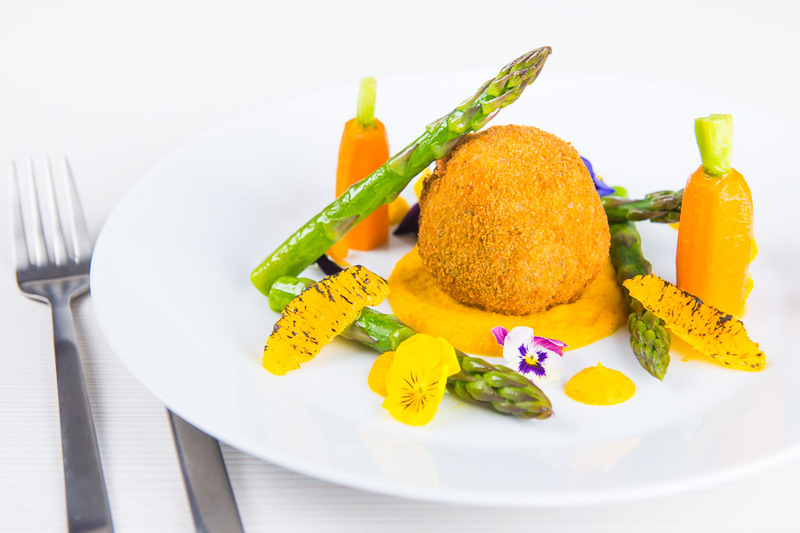 These confit duck leg bonbons are at the centre of a surprisingly light and wonderfully fancy meal featuring an orange and cumin puree and asparagus. 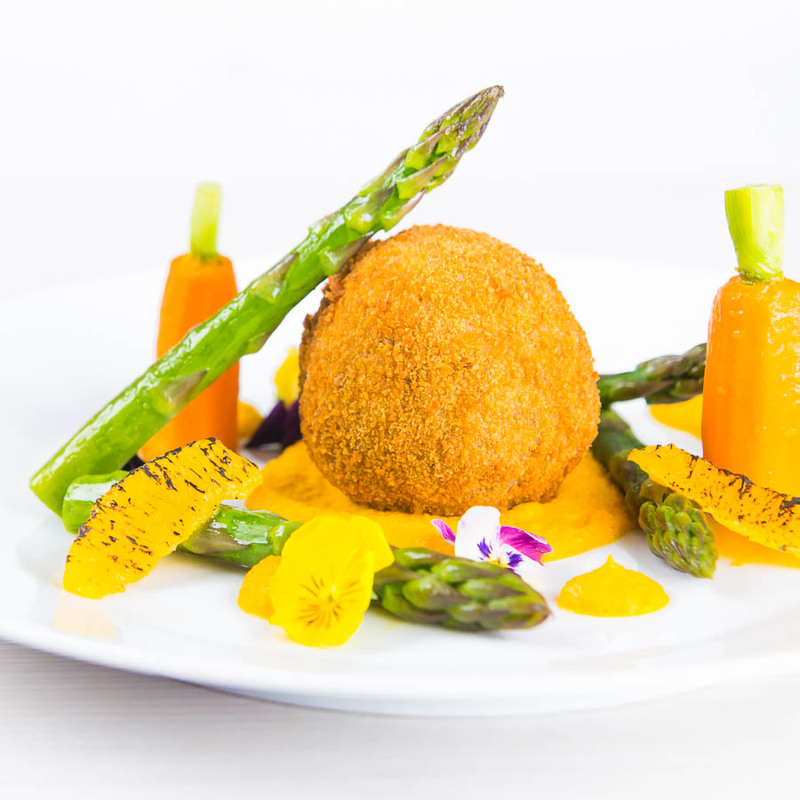 Confit Duck Leg Bonbons with Carrot Puree and Asparagus. Regular readers will know that I am fond of both impressing my wife with dinner and duck recipes. This was aimed at doing both! It also worked on both counts. I love confit duck, sure it is not something to do all the time, it is seriously indulgent. But once in a while, we all deserve indulgent food. Like all of my recipes, this confit duck leg recipe is all about combining flavours that all work together. So the carrot puree features both orange and cumin, we all know how well duck works with orange. 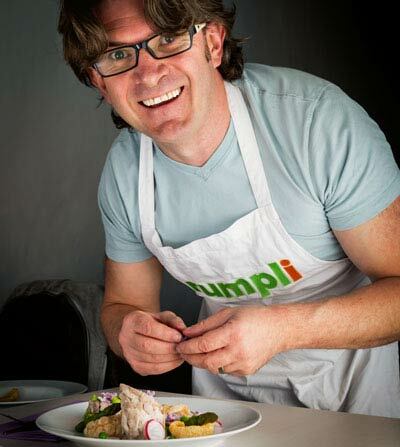 I have both a duck salad and duck a l’orange recipes here on Krumpli that feature orange. 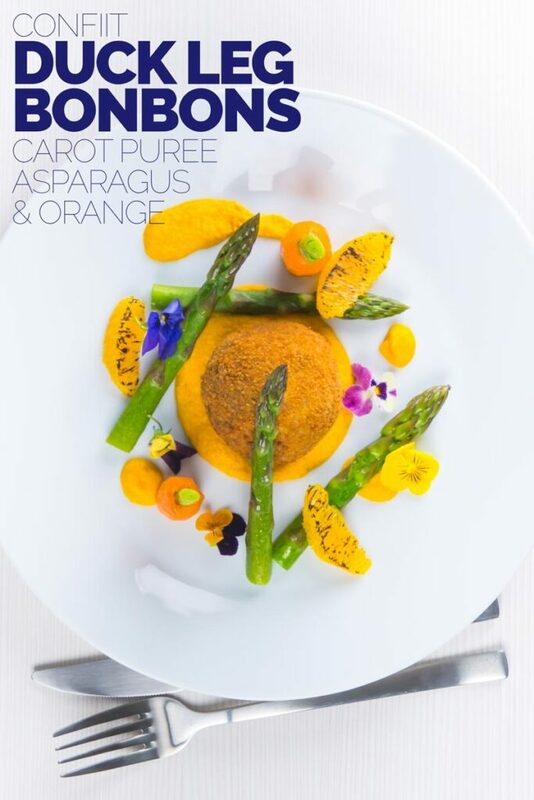 Of course, orange and asparagus is also another classic combination. So what we have here are flavours that we know work, they have been used forever! Confit is the slow cooking of a food in fat, duck or goose fat typically. Yes, that is as indulgent as it sounds. It is also as magical as it sounds, we all know what roasting potatoes in duck fat does to roast potatoes. Well imagine all that glorious flavour wrapped up in meat. Meat that has been gently poached in duck or goose fat. That is what duck confit is, you take the legs and allow them to gently cook in duck or goose fat. It leads to the most incredibly tasty, moist and succulent meat that shreds wonderfully. The fat also acts as a preservative so you can make the confit duck legs up well in advance and in bulk. The meat is perfect for making bonbons or burgers. Speaking of burgers I did a duck burger here last year, it was amazing. Unlike this dish, it features roasted duck legs rather than confit duck legs. If you are indulgence averse you could, of course, use the method I used there to create your duck bonbons. The result will be great, just not as great as confit duck! You may also be lucky enough to be able to find confit duck in stores. If you can feel free to use it in this recipe. It will save a little bit of work, although most of the saving will be in washing up. My Love Of Duck Recipes. Duck for me is the most wonderful meat, rich and strong in flavour. Simple to cook and without a doubt always feels special. These confit duck leg bonbons are far from being the first duck dinner on my website. Whether it by my teriyaki duck donburi, my Thai duck red curry or my simply pan-fried duck breast with balsamic vinegar you can not go wrong. There are two ways really to cook duck, cool and slow or hot and fast. Don’t go somewhere in between your duck will have the texture of boot leather! These duck bonbons are firmly in the cool and slow school of how to cook duck. Neither is superior to the other and definitely yield meat that is used for different purposes. Do you love duck? Do you have a favourite duck recipe? Drop me a note in my comments at the bottom of this page, I’d love to find something new! These confit duck leg bonbons may look all sorts of fancy but they are deceptively simple to make and form the centrepiece of a fantastic and spectacular main course! Take your duck legs and rub with the salt and cumin seeds and allow to marinade for overnight. Wipe the cumin and salt off the duck. Cover with the duck fat ensuring the legs are completely covered and add the rosemary. Place in the oven at 150°C or 300°F and cook for 2 1/2 hours. Remove the duck legs from the fat (reserve the fat for later recipes) and shred. Using wet hands form the duck confit into balls and refrigerate for 30 minutes. Remove the top 35mm from the carrots and finely slice the main body into 3mm coins. Add 35g of butter to a pan and add in the carrot coins, a good pinch of salt and cumin, cook for 5 minutes. After 5 minutes add in the cream and orange zest, season with salt and cook for a further 20 minutes. 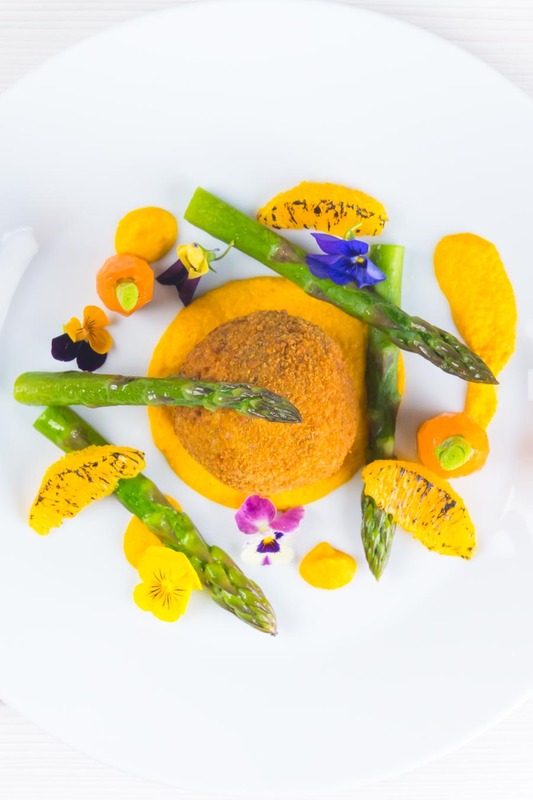 Place the carrots in a blender and blitz to a smooth puree, passing through a fine mesh sieve when blended. Add the remaining 15g of butter with 50ml of water to a pan and throw in the carrot tops and add a lid. Remove your duck balls from the fridge and roll first in flour, then the beaten egg and finally into the breadcrumbs. Cut off the rind from the orange and cut into segments. Squeeze out the juice from the remainder of the orange into the carrot puree and reheat. Just before you fry off the duck bonbons add the asparagus to the carrot tops, return the lid and cook for 4.5 minutes. Fry off your duck bonbons for 4-5 minutes until golden. Whilst the bonbons are cooking blow torch or grill the orange segments to caramlise. 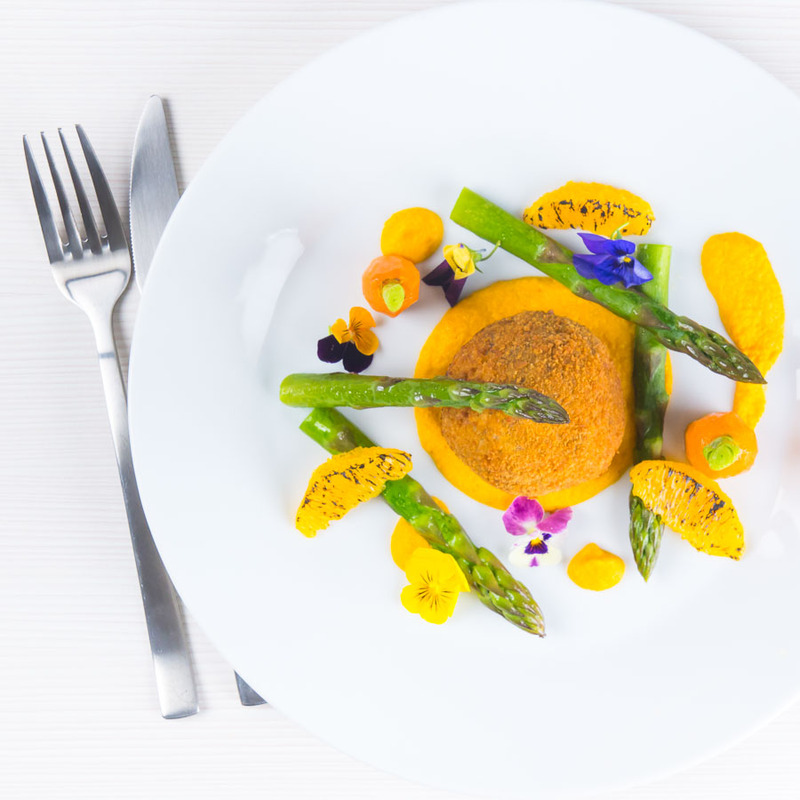 You can prepare the duck bonbons and carrot puree well in advance making this dish a great dinner party date night recipe! Now, this recipe will be one of my favorites. Looks incredible! Wonderful combination of ingredients. And a very beautiful presentation!!! I’m sure these tastes are amazing! So YUMMY! Now this is the kind of recipe that I fall in love with. It sounds absolutely perfect and delicious. So much decadence and flavor! I’ve never cooked duck leg but if I did I may well take your tip for cool and slow – we have goose for christmas dinner and it gets slow cooked for over 6 hours in the oven. The colours and flavours of this look amazing – never heard of a duck bonbon before but I’d love to try it! I think low and slow is the way to go if roasting whole but a couple of hours in fat is so naughty but so damn good! This looks so fancy, certainly will impress! The flavour combinations sound so ducking good! What beautiful presentation and wonderful bright flavours! I agree, once in a while, we all deserve indulgent food! Pinning this!